Many actors reinvent themselves. From Matthew McConaughey to Robert Downey Jr., career bests are only one good script away. Keanu Reeves is doing something similar, albeit with less cultural significance. He starred in the excellent action genre piece John Wick, which he followed up with the Eli Roth horror flick Knock Knock. It used to be cool to hate Keanu Reeves, with his performances in generic action movies like Speed, and The Matrix Trilogy defining his career for many. But the actor has shown his ability to star in unique and interesting films too, and his excellent performance in Richard Linklater’s A Scanner Darkly, alongside his earlier work with Gus Van Sant in My Own Private Idaho highlight Reeves’ ability to resist definition. Knock Knock is a good fit for Reeves with its rigid structure, its adherence to genre tropes, and it’s overt reliance on narrative conventions. Keanu slots into the story and provides what’s ostensibly a B movie with some A-list Hollywood credentials. The film is a remake of 1977’s exploitation genre piece Death Game, and it tells the story of a middle aged happily married man, Evan Webber (Reeves) left alone at home, while his wife Karen (Ignacia Allamand), a successful artist, takes the kids on a short weekend holiday. Their home is a suburban dream, full of culture, stocked with an expensive record collection, fine foods, and wine. They have two children, a boy and a girl, and a little dog too. It’s the epitome of middle class opulence and it’s the perfect contrast to the events that follow. Late at night, in the midst of a storm, two young ladies (Lorenza Izzo and Ana de Armas) knock on Evan’s door. They’re looking for a party in the neighbourhood but can’t find it, and Evan, out of the kindness of his heart, let’s them in to call their friends and dry off. The story that follows is one of seduction, illicit sexual encounters, blackmail, and eventual torture. Evan’s character, already foreshadowed by an early conversation with his wife, is effectively the knight in shining armour archetype. His wife complains about his flirting with a young 25 year old at the supermarket checkout (he claims he was helping her bag her groceries), and there are plenty of subtle suggestions that he struggles with monogamy. The film opens with sterile, clean, suburban American life, a place of safety and wholesome happiness. But it’s also a place of boredom, a place where Evan can pretend to be a monster when playing with his kids, but a place where he has to suppress his base instincts, and toe the societally dictated line. Knock Knock comes from notable horror director Eli Roth, but surprisingly doesn’t have much reliance on gore, or even blood. It’s a far more psychological affair, one that relies on Evan’s complete and utter destruction as a father, a husband, and as a good person. It deals with its subject matter with satire, rather than shocks, and mostly the tone works well. But it’s also a film that focuses on Evan’s transition from wholesome family man, to an unhinged, violent, and sexually driven person. His temptresses don’t let up, and they force him to become an angry and aggressive figure. Evan’s veneer is chipped away and his good guy persona is quickly revealed to be a mask. Good Guy Evan (Keanu Reeves). The suburban setting becomes increasingly apt as Evan reverts back to an animalistic state. His home, located on the fringes of civilisation, is just as close to the rugged mountains, and the terrifying potential of nature, as it is to human society with its rules and laws. Evan’s story becomes one of binary opposition, and it’s told with a specific focus on conflict. There’s his safe and sanitised life that collides with the allure and sexuality of the young women on his doorstep, and there’s the battle within himself to remain faithful to his family. But there’s also an interesting subtext that emerges too. Evan is rendered impotent; he’s incapacitated by the girls, and he’s forced to watch as events happen to him. It’s similar to the narrative device used in Michael Haneke’s Funny Games, and both stories place the traditionally dominant male figure in a vulnerable position. He can’t fight back and he becomes emasculated. Full of sexual tension and symbols, Knock Knock has shades of Hard Candy and Spring Breakers in its narrative decisions, but ultimately, like the title itself, it remains unresolved. The ending is disappointing, and unfortunately Roth’s film fizzles out, instead of ending with a bang. 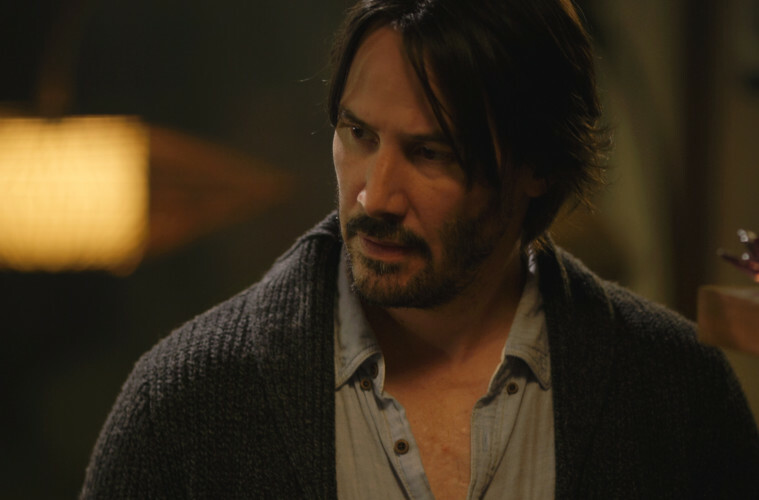 But it’s also a competent piece of exploitation cinema that adds to Reeves’ legacy as a reliable actor to hang a genre piece from. It contains a simplistic sense of morality, and a good deal of didacticism, as befits its exploitation origins. The moral of the story? Don’t cheat on your wife, because it could literally kill you. Forget love and loyalty, fidelity is all about self preservation. I really wonder what you mean by this. Keanu has done a lot of different things from blockbusters to indies, in all kinds of genres. I can maybe see you saying this if you’ve only seen Speed and the Matrix trilogy, but how are his roles in for instance My Own Private Idaho, Thumbsucker or more recently Generation Um generic casting choices? Yeah, I completely agree. I phrased that badly, and I’ve edited the paragraph. Reeves’ work in My Own Private Idaho is a great example of his acting potential. I just meant that for many people he’s defined by his roles in generic action movies. But I think he’s changing that perception with his recent work in Knock Knock and John Wick.